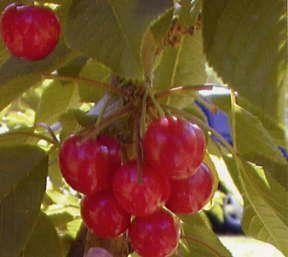 The Montmorency Cherry has long been recognized as the standard of the tart cherry industry. Grandpa grew and picked many Montmorency as a kid, and was glad when mechanical harvesting came along in the 1960’s. It sure took the drudgery out of picking in the hot July days. Montmorency is self-fertile and requires no pollinator. The tree is vigorous and easy to grow. Its height is 12-18 feet and the spread should be 10-15 feet. It is somewhat susceptible to cherry leaf spot, so try to control it as long as possible. If it drops its leaves earlier in the summer, do not despair. These trees will almost always come back with a nice crop the following year. In areas where winter snow isn’t replenishing the water tables; you need to make sure that you give the trees enough water to survive and keep the trees alive. Montmorency is early to bear fruit, in late July and is very productive. The fruit is bright red and is medium in size. It produces a very tart taste with a clear, juicy flesh. Many people love to use them in the kitchen for baking, making pies, canning and juicing. The Red Jonathan Apple hardly needs a description since it is one of the most popular heritage apples in the Midwest. Ripening in the early fall, the taste is described as a juicy, sweet- tart that is crisp. The appearance is slightly striped, but mostly red. Our strain is highly colored and sizes well for this medium sized apple. As far as storage is concerned, it keeps very well. Red Jonathan apple is on sale right now and is very easy to grow, even for beginning orchardists. The tree benefits from pollination, but will do good on its own as well. You should thin heavily for a better size. It is very susceptible to fire blight if grown over vigorously. In Michigan, Red Jonathan is one of the preferred pie apples for the pie industry. Grandpa grows many Jonathan apple trees and has sold just as many to other apple growers all across the state. The Anjou Pear is a favorite European winter eating pear with large, conical, short-necked fruit that is light green and has slightly brown russeting. Pears in general are long-lived, hardy trees kept for their pretty bloom in the spring, as well as for their fruit. In Grandpa’s day, the farmers used to line the roads with pear trees; you can still find some ancient trees around today. Anjou pear pollinates well with any other pear, so planting it with another pear is suggested to improve production of both. Like most pears it is rather upright growing, sturdy and vigorous. Fire blight is a concern with all pears, so don’t over-fertilize or prune excessively. Most pears are very hardy and somewhat frost resistant, so they don’t require the best conditions to thrive. The trees are large, vigorous, hardy, very productive and early bearers that ripen in late September. As far as cooks are concerned, Anjou pear is a favorite for baking and canning. They have a mild, fine textured white flesh with a delicate aroma. The fruit will store for very long periods, and actually improves in quality after a couple months of proper storage. The Redhaven Peach is a must have for any backyard orchard. It has replaced Elberta as the standard to compare peaches to. When Grandpa first saw Redhaven, he couldn’t wait to test it out. He is pleased to say that it met and surpassed his expectations at that time. Redhaven is open spreading and vigorous; it grows 15 feet high and the spread is also 15 feet. This tree requires heavy thinning as it sets a lot of fruit. Growers should thin it 8-10″ apart on the last years of growth. Older spuradic growth should be removed to promote vigorous growth and large size fruit. The tree needs to be trimmed annually and sprayed for leaf curl and brown rot. The tree has good resistance to bacteria spot. Redhaven ripens early in the season and is usually freestone, although in past years has been a little “clingy”. Redhaven Peach has a wonderful red color over a yellow background. The flesh is yellow with a little red near the pit. It is juicy, sweet, and very tasty. It can be used for all purposes, such as baking pies and cooking jam. The Stanley Prune is a fine prune-type plum with excellent quality suited for fresh eating, canning, preserving and drying. The fruit is large in size, with dark blue skin and a greenish-yellow fine grained flesh. You should know it is early bearing and ripens around Labor Day. Also, it is a heavy bearing tree that is an annual bearer as well. Stanley is a mostly self-fertile tree, like most European-type plums, and will set nice crops without other pollinators. However, keep in mind that extra pollination always helps. It will grow to be 10-15 feet high and has a 10-12 foot spread. Stanley is susceptible to black knot; growers should cut it off (and out) of the tree as soon as possible to control it. Grandpa grew mostly Stanley Prunes on his farm for the market because it was so outstanding.